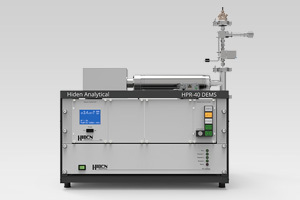 The HPR-40 DSA is available with a range of DEMS cells for differential electrochemistry mass spectrometry. DEMS cells include a nano porous membrane interface for fast response in-situ determination of gaseous and volatile electrochemical reactants, reaction intermediates and products in real time. A novel differential electrochemical mass spectrometry (DEMS) cell for integration with the Hiden Analytical HPR-40 DSA membrane inlet mass spectrometer systems. The new cell, developed by Ezra L. Clark and Prof. Alexis T. Bell of The University of California, Berkeley Lab, coupled with Hiden’s differentially pumped mass spectrometer system provides for in-situ mass resolved determination of gaseous or volatile electrochemical reaction intermediates and products in real-time.